For a fun feel of the room, a nice design would be white picket fences on sky blue walls. Decorated with incredibly large paper flowers of occupant's favorite colors and grass stalks. The flowers attracting swarms of butterflies of various vibrant colors. 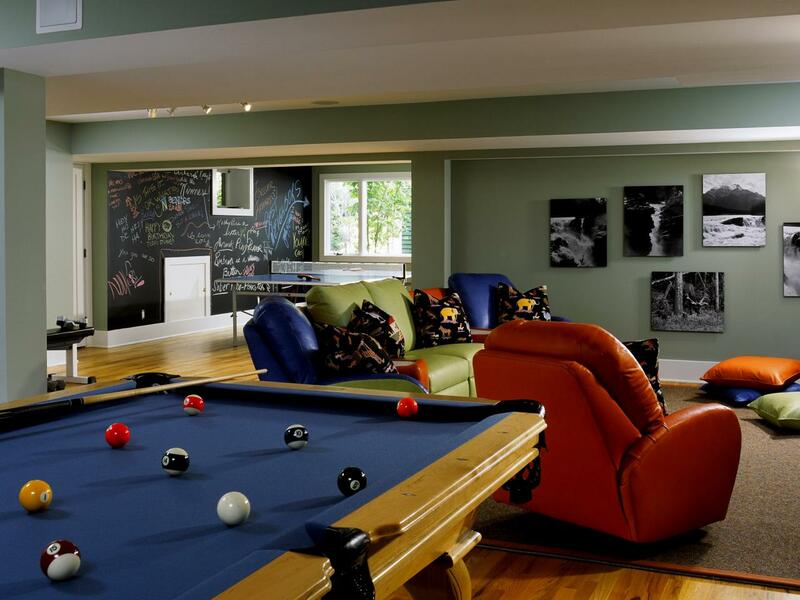 A simple enough design but when done right, your child would never want to leave the house, much less their room. Do you have a child that likes to read a lot? It has always been said the adventures await anyone in between the pages of a book. How about you bestow on them a tree bookshelf where they would be able to store all their favorite adventures. Done in the corner of the sky blue room, a shelf in the form of tree that it looks like the room's occupant is reading outside. Perfect for the bookworm in your child. Give our child's room that Alice in Wonderland or fairy world vibe by including, on one wall, a "fairy door". A small door for fae creatures or possibly creatures from wonderland that ate the Eat Me biscuits that would make anyone small enough to fit such a door. Highlight it with white trimmings and above the door is an exclamation of either "I believe in fairies!" or "We're all mad here. ".The whole design would certainly put a smile on your child's face. How about highlighting a room with a Rag Rug? Made from strips of cloth that may or may not be leftovers from other projects crocheted into a rug net, it is perfectly cozy for when your child is sits on the floor Indian style.Whether they are just playing, reading a book or just relaxing, the comfort a Rag Rug provides, regardless of color, is unmistakable. Have a child that loves to paint or draw? Provide them with a Gallery Wall where they could display all their artworks. A crisp white wall would be the perfect backdrop. Mount on it, yellow painted frames of various sizes and within those frames, attach little clothespins or clips. The little boy or girl could simply clip their artwork within the frames and enjoy them for the next few days. Is your Child a Budding Skateboarder? How about using skateboards as shelving to display treasured pictures and memorabilia such as action figure collectables or figurines. Just attach L-shaped brackets to the walls and screw on the skateboards. That's it. Instant stylish shelving for a child's storage needs. Refurbish an antiquated toy wagon to service as a make-shift book case for your child's books.It would highlight your child's playful side and book lover side. Plus, your child would not have to carry plenty his books when, say, he or she wants to read them at a different part of the house. What about hanging round colorful paper lanterns in a mostly predominant white room? 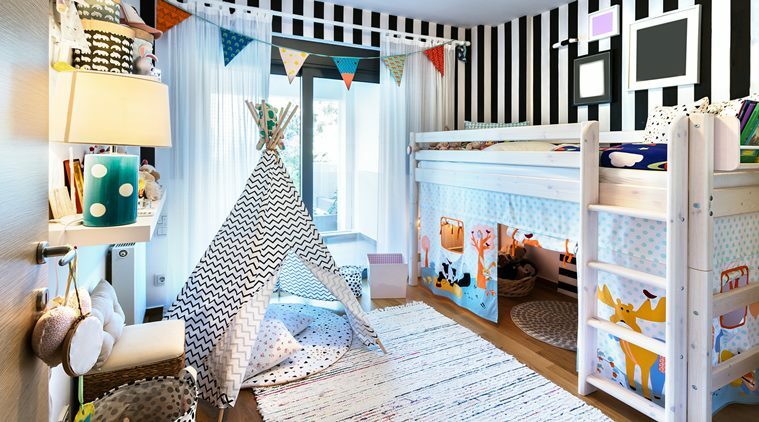 The colorful lanterns, along with other knick knacks in the room such as artworks on the walls, toys on the white furniture and the vibrant display pieces make the room come alive against the white background. Take it up a notch and actually install working lights in those lanterns to give the room a lovely ambiance during the night when not using the lights from the ceiling. For your little princess, how about adding a light blue vanity to that pristine white room of hers?Another facet that would add color to her room aside from her bed sheets and pillows, her toys and the rug on the floor.Besides the obvious that it would serve as its name implies, a vanity, it could also serve as a sort of study table for the little beauty. When your child, whether they be a girl or a boy, is an up-and-coming world traveler, why don't you decorate their room with a world map mural. As they learn about the different countries, famous sites located in them and their histories, perhaps they could continue discovering more information about the said countries at home. Starting with their locations on the world map mural in their room.